One of the privileges of my job is that I get to experience some really special things. 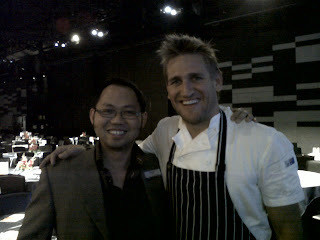 One of these things is to watch Curtis Stone carry on with Raymond Capaldi (George Calombaris's mentor). Another is to eat a meal cooked by Curtis Stone. Well, at least, it was a team of chefs at the Peninsula (self described as "Melbourne's most glamorous and avant-garde waterfront event space") supervised by Curtis, with Capaldi apparently also in the kitchen. The great thing about Curtis is that he's just your everyday gregarious bloke who wants to share the joy of food and cooking with the world. And to show Australians how to feed your family for under $10. What's more, this guy's even been on Oprah!! This guy is a giant!! I'm not a big fan of a sweet dessert, but I must say that the Curtis Rhubarb and Custard in a light crispy pastry has got me liking rhubarb (when it never even registered in my consciousness before!). It's described on the menu as a "fuilletage of burnt orange custard, poached rhubarb, almond crumble, mascapone". But to me, it was really just a sweet veg on a bed of TASTY (expressed a la Samuel L Jackson in Pulp Fiction) custard in a light pastry box. This is an amazing little veggie that only needs to be poached to be ready to eat as part of your dessert, and the custard provides a nice complementary flavour. And as for the custard - well, You'll Love Coles custard is a nice and easy way to get it sorted (yes shameless plug I know).